Customers of discount cabinet retailer Kitchen Cabinet Depot can save an extra 10% on online orders of kitchen cabinets of $500 or more. The special promotion is now available. Customers often choose finished RTA kitchen cabinets because they can save money on installation. By offering an added discount, we make the savings even greater. Kitchen Cabinet Depot announces a special discount promotion of 10% off online orders on its kitchen cabinets. Customers ordering kitchen cabinets with a combined total of $500 or more can receive the special offer by entering the discount code ONLINE-DSCNT when checking out online. The promotion is only available for finished RTA kitchen cabinets. The discount offer is available for a limited time only. Kitchen Cabinet Depot offers a wide range of discounted kitchen cabinets available for purchase online. The company is known for its comprehensive selection of RTA kitchen cabinets that come in a variety of styles, finishes and stains. In an effort to help customers save even more on kitchen cabinetry, Kitchen Cabinet Depot also offers free shipping on orders of $1,500 or more throughout the contiguous United States. Customers who have Facebook accounts can receive even further savings when they "Like" Kitchen Cabinet Depot online. The company offers exclusive savings and specials discounts through its "Like Coupon" that can also be combined with other discounts for added savings. "Kitchen Cabinet Depot has been in business for 35 years because we continually offer high-quality products, including superior kitchen cabinets," says Bob Peters, CEO of Kitchen Cabinet Depot. "Customers often choose finished RTA kitchen cabinets because they can save money on installation. By offering an added discount, we make the savings even greater." RTA kitchen cabinets come in a variety of styles including golden shaker (the company's most popular style), walnut merlot, spiced maple, café latte, honey oak, cherrystone bronze, glazed mocha cream and more. Kitchen Cabinet Depot only uses solid wood in the construction of their kitchen cabinets and never uses any particleboard in any of their products. "Kitchen Cabinet Depot only sells superior kitchen cabinets," continued Peters. It doesn't matter what kitchen cabinet style a customer selects. 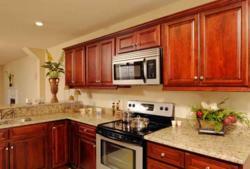 Our kitchen cabinets are designed to help customers build dream kitchens." Customers who wish to purchase finished RTA kitchen cabinets can visit http://www.kitchencabinetdepot.com.